We are a privately owned family Company which has been trading throughout South Wales since becoming a Limited Company in 1948. As macadam and asphalt surfacing contractors we cover an area from the Severn Bridge to Fishguard and North to Aberystwyth and throughout Mid Wales. Occasionally we carryout works further afield. We undertake various surfacing works both as Main and Sub-Contractors, including hand and machine laying of all grades of stone, concrete, bituminous macadam SMA and hot rolled asphalt. 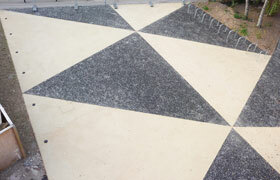 We are experienced with laying tennis courts, paths, driveways, carparks, roads, motorways, runways etc. We also undertake various civil and building works such as the complete construction of new roads and car parks. High quality service and results - with over 60 years in the industry, you can rely on our friendly, highly skilled, directly employed workmen. Free initial consultation and quote with no obligation - we're happy to come out and see you to discuss your needs.